Presented by the Consumer Technology Association (CTA), CES is a global stage in which next-generation innovative thoughts, discoveries, and inventions are shown to people in the world. Beginning in 1967, it has served as the platform to show for innovative people and latest technologies for more than 50 years. Every year, a series of innovations from all over the world will be shown and those who perform outstandingly on the consumer technologies will gather here. There is no exception for the CES 2018. CES 2018 was held from January 9th to January 12th in Las Vegas, which successfully attracted global business leaders and thinking pointers to join it. Featured speakers of every field from all over the world like Qi Lu, Nancy Dubuc, Brian Krzanich, Charles D. King delivered a speech on the latest development of human science and technology. Lots of latest innovations and high-tech products were gathering here to give the world population a feast of the latest technologies. For example, Acute Angle PC, Planet Gemini PDA, Mirage Solo and many other wonderful high-tech products and weird inventions are included in this exhibition. In CES 2018, the latest technologies and products from China technology giants win the likes from the world high-tech enthusiasts. Xiaomi, one of the technology giants in China, also brought their latest technologies and products to participate in the CES 2018. Xiaomi Handheld Vacuum Cleaner is one of the most important smart home products of Xiaomi ecological chain shown in the CES 2018 with its compatible advantages, which can bring the best user-experience to you. Considered as Dyson’s terminator, it performs more exceedingly than the vacuum cleaners of Dyson in each aspect. With super suction, it can remove the debris,m steel beads, dust and other wastes all in a sudden. Its anti-mite sterilization PM 2.5 promises you almost bacteria-free environment. It is characterized to be lightweight so it will be easy to operate. Added the latest technology of Xiaomi, it will not produce too much noise. Xiaomi Wireless Vacuum Cleaner will lead the new revolution in the house cleaning gadgets. 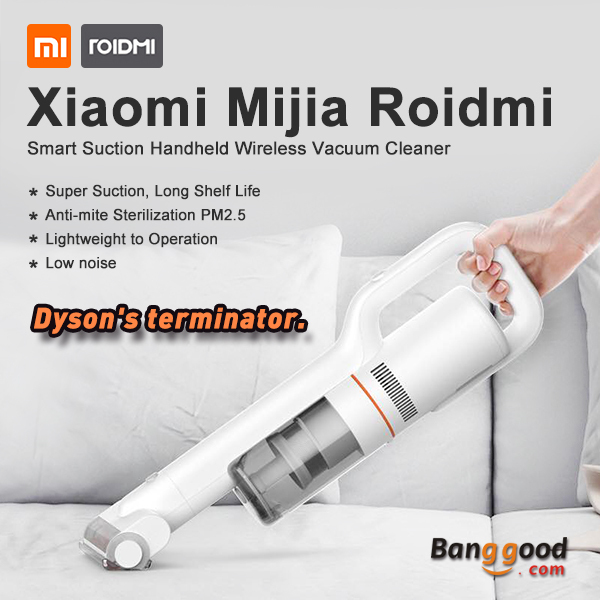 Banggood, one of the most important e-commerce retailers in China, will be the first one to release this Xiaomi handheld vacuum to you in addition to Xiaomi official website. It will put into pre-sale in Banggood in March 2018. And now you can contact with Banggood staff or log in to the Bangood forum to gain more detailed information. People who are interested in it can also share their knowledge about Xiaomi handheld vacuum with all of us on this forum.